Posted On April 07, 2017 by Team iCynosure. I’m sure most of you are aware of my immense affection for Baaya Design for their unique theme where design meets tradition. The retail store located in the heart of Mumbai city offers a unique range of traditional and tribal art that transforms any living space into a cultural environment; with beautifully crafted pieces that promote art forms of Gond, Warli, Lipikam, Madhubani, Kalamkari, Dokra, and much more. Shibani Jain, founder and chief curator at Baaya Design shuttles her time between identifying and nurturing new talent and art forms and bringing them to the retail store to promote and give wings to the artists. The summers are here and in the heat, Baaya; is yet again set to offer brands that will bring in the cool quotient for the fashionista in you. Shibani has brought new brands Ohar, Stone Vibes and Sasha that will ensure you break the fashion monotony and indulge in something that has been specially created for you this season. The 4-day ‘Summer Somethings 2017’ exhibition beginning today will allow you to pick the best from the brands; especially light and trendy natural fibre garments, semi-precious stone jewellery, and embroidered clutches. For the uninitiated, fear not. Here is all you need to know about the brands that are being showcased during the exhibition. OHAR works with a vision to craft each design with supreme care, providing an ineffable experience to the user. Under the Organic range, Ohar has used 100% Organic & Sustainable fabrics that are comfortable to wear and designed for Indian summers. For the handloom range, they are trying to innovate classic fabrics such as khadi or handwoven fabric from various parts of the country in modern but graceful silhouettes paying supreme attention to every detail from fibre to garment. STONE VIBES was born out of sheer love for colours and the positive vibes that the stones exude. All the pieces are carefully put together and thoughtfully designed to suit the woman of today, who are fearless, independent and confident. Crafted of copper, silver, and micro gold, stone vibes have a full range of earrings, bracelets and neck pieces for both casual and formal occasions. 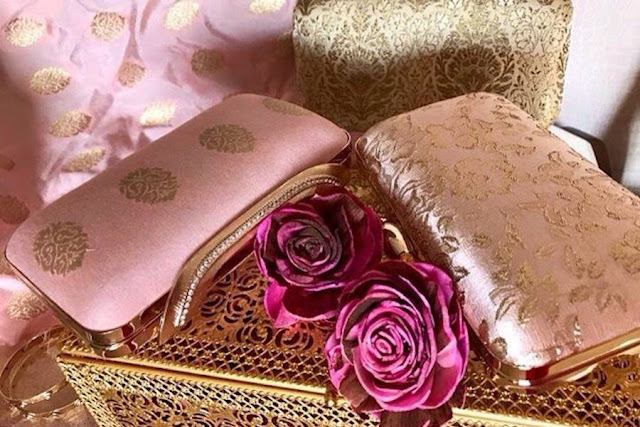 SASHA is a luxury brand of exquisite handcrafted and embroidered clutches, custom made for every occasion created by model and designer Mamta Raja. The range of handmade collection includes the Maharani Collection on a rich silk embellished with faux pearls and gold thread work, Jaipur collection inspired from the beautiful city of Jaipur with its magnificent forts, palaces, peacocks and elephants, clutches on beige raw silk with zardozi embroidery and much more. Aren’t these beautiful? Well head to the store and you will find many more options to pick from.